In this view, then, the whole of reality is nothing but the creative self-expression of the Absolute. It is the articulation in tangible form of the myriad ways in which Goddess Awareness reflects on Her infinite Being. It is Her self-awareness flowing into form, coalescing into patterns of embodiment. The universe exists for no other reason than Her innate urge toward creative self-expression; and the medium of that expression is nothing other than Herself. 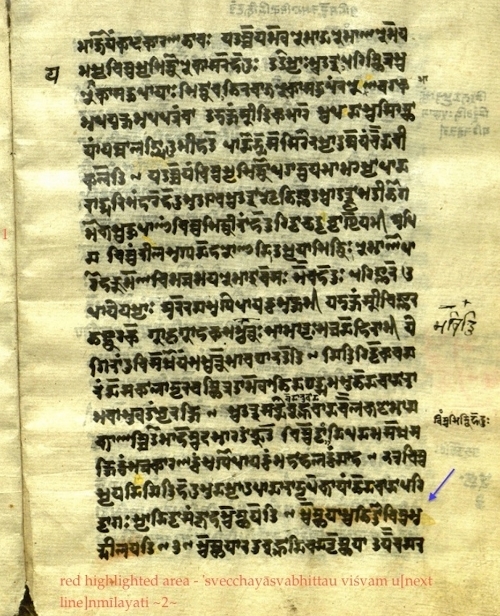 A manuscript of the Pratyabhijñā-hrdayam in Śāradā script; the arrow points out where sūtra #2 occurs. Thanks to Christopher Tompkins for the manuscript. The Tantrik authors who flourished in Kashmīr in the tenth century were nearly as interested in the philosophy of aesthetics—which explores the question of what makes art beautiful—as they were in spiritual inquiry. It is not surprising, then, that Kshemarāja chooses an artistic metaphor when he comes to describe how Awareness expresses itself as the sensual universe. Let’s break down the words of the sūtra to deepen our understanding of the metaphor. The verb unmīlaya, “unfold,” or "display, cause to appear," also means “unfurl, open up, [or] cause to blossom.” It is a word normally used for the blossoming of a flower, the opening of the eyes, or the gentle and gradual unveiling of something previously hidden from view. The unfolding of the universe (or just “everything,” viśva) takes place through Her own will, where the word used for “will” (icchā) is also used for creative impulse and the urge toward self-expression. The metaphorical substrate for this unfolding is likened to a canvas: in fact the word bhitti means a screen, a wall, or a plaster surface prepared for painting. Kshemarāja indicates that the metaphor only goes so far, since in unlike in the normal state of affairs where an artist and her materials are separate, here the canvas is simply an aspect of Herself. To sum up, then, Awareness flows into form as a creative act, arising solely from its desire for self-expression, and the substrate or ground of this process is simply itself. Note that in the mainstream Tantrik tradition, this substrate or ground is normally identified with the masculine deity Śiva, which is why you will see images of the Goddess sitting on top of a prostrate Śiva. He is the symbolic ground for her dynamic, creative activity. But here, in the radical nondualism of the Recognition school, Kshemarāja wants to avoid the implied dualism of the standard Śiva/Śakti paradigm, so both roles are pictured as aspects of one absolute Goddess power. Let’s now explore Kshemarāja’s commentary on his own sūtra. Through that [will] alone, without relying on any external materials or causes—for if She were dependent in this way, she would not have the autonomy (svātantriya) that we have described [as inherent to Awareness], and therefore the very fact of being Awareness would be compromised. Kṣemarāja clarifies here that he does not picture Goddess Awareness as a traditional creator deity under some other name, as already mentioned above. Therefore “she” does not require any materials outside of herself with which to create—because creation all takes place within Awareness, and nothing is ever external to Her/It at any time. Kshema tells us that if it were otherwise, then that would mean that Awareness was dependent on something outside of itself, not truly independent after all. Since Awareness' inherent nature is unbounded freedom, without the latter it would not be Awareness, but simply an inert object like a pot. Think about the implications of this for your own life. As we will discover in sūtra four, you are a microcosm of the whole, which means that anything that is true on the larger scale is also true within you. Therefore, your whole life is an expression of what is within you, and furthermore, you have everything that you could need inside of yourself to manifest a fulfilling life; to realize the full beauty of your unique expression. If you think you need something outside yourself to accomplish that goal, that is wrong understanding. Having said that, the true beauty of a life is revealed only on Life's timeline, not your mind's. Contemplation: Look at your life situation clearly and without judgment, realizing that it is the expression of your inner landscape. Take responsibility for what you have manifested. Then affirm to yourself that since the pattern of the Whole exists within you, you have everything you could ever need to make the painting called “my life” exquisitely beautiful. Now let’s continue with Kshemarāja’s commentary. ‘On the canvas which is Herself,’ and not on anything else, She unfolds this universe [consisting of knowers, ways of knowing, and things known] as if it were separate and different from Herself, though in actuality it is not separate, just like the image of a city reflected in a mirror [is inseparable from the mirror]. The Power of Awareness expresses as all the interdependent activities of subjects and objects—the variegated patterns of color in the “painting” of the universe. That same Power, in its unmanifest aspect, also forms the substrate for all that activity: the formless ground of all things, which is itself completely empty (like a blank screen or canvas), yet full of the potential for absolutely everything. To make it clear that the canvas/painting metaphor is just one possible analogy, in the above paragraph Kshema offers another comparison, one that was fairly well known in his time: that of the city in the mirror. Imagine yourself standing on a hill overlooking a city in a valley below. You then turn your back on the city and look at its reflection in a relatively small mirror. All the citizens, all their creations and activities, are all contained within that single image; and the image is inseparable from its substrate, the mirror. Just as there is no painting without a canvas, there is no image without a mirror. Though the moving image in the mirror is what fascinates our senses, the unchanging substrate is what abides. In the same way, the whole of reality is held as a reflection in sky of Awareness, inseparable from it. It is difficult for the mind to grasp this, because the “substrate” is, in reality, intangible formless spacious Awareness (or aware spaciousness). What is unseen is more real, in a sense, than what is seen, if that which abides is more “real” than that which is ever-changing. Furthermore, the unseen is precisely what manifests as the seen. The “city in a mirror” simile only extends so far, because there really is no “city,” only the reflection. Again, the “reflection” here is the ever-changing field of manifestation, and the source and ground of the reflection is the field of infinite potential, as Kshema tells us next. And this process of unfolding is simply the making manifest of what is [constantly] abiding [within Awareness as latent potential]. Everything that has ever been and everything that ever will be exists in a latent state within the field of absolute potential—the implicate order that is said to be simultaneously empty, yet “pregnant” with the possibility of everything whatsoever. Everything that manifests emerges out of this “ground of being,” is sustained by it, and merges back into it once again. As mentioned above, this is where the metaphor Kshema has been using breaks down, because though anything can be painted on a canvas (or reflected in a mirror), we cannot say that all possible paintings abide within it (except in a poetic sense), nor can we say that the canvas “manifests” the painting. Nor is there a separate artist; artist, canvas, and painting are all aspects of one thing: the Light of Awareness. Just as there cannot be a painting without a surface that supports it, or a movie without a screen, the world exists in a state of oneness (aikātmya) with the Light of Awareness. Kshema returns here to his fundamental teaching metaphor, that of light, for in the end it is the most apropos. What we were calling the substrate or canvas or “ground of being” above can be understood as pure white light in this analogy, whereas manifestation is the refraction of that light into a variety of colors. Unlike in the canvas example, all possible visible colors are literally contained within white light. This refraction into color is, as we shall see later, the Light’s modes of self-reflection (vimarśa). There is never any separation of color and light: in the same way, what we call the world has always been, and always will be, a manifestation of the One. This completes our study of Sūtra Two and its commentary; I've here given you all of chapter two of my forthcoming book, The Recognition Sutras. * The second, poetic translation was suggested by poet Alicia Frost.